The first round of Brazil’s presidential election has set the stage for a runoff playing primarily to class differences. By the eve of the election, polls hinted at the real possibility that the center-right candidate Aécio Neves of the Brazilian Social Democratic Party (PSDB) would edge out the other principal opposition contender, former Minister of the Environment Marina Silva. Silva enjoyed a spike in the polls after she replaced the late Eduardo Campos, who perished in a plane accident in August, as the Brazilian Social Party (PSB) candidate. Sunday’s results confirmed Silva’s decline, as she captured only 21.3 percent of the votes compared to 33.5 percent for the PSDB and 41.6% for incumbent President Dilma Roussef of the Worker’s Party (PT). The PT used its potent propaganda machine to portray Silva as a potentially dangerous candidate – an indecisive leader who could not be trusted to sustain popular social programs such as the Bolsa Familia conditional cash transfer program, which has helped lift millions of Brazilians out of poverty. 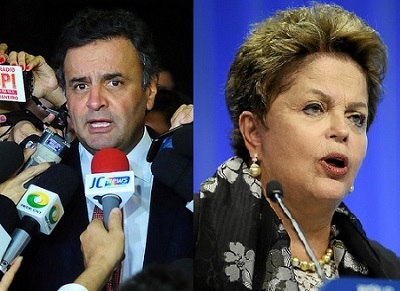 Also, Aécio and Rousseff built their images upon two iconic ex-Presidents – the former on Fernando Henrique Cardoso (FHC) – seen by the middle and upper classes as the leader who managed to defeat hyperinflation and putting Brazil on track for economic growth – and the latter on Lula, Rousseff’s mentor, who is idolized among the most disadvantaged parts of Brazilian society as the President who helped the poor become less poor. To win the runoff on October 26, Aécio needs at least 70 percent of Silva’s votes – she has only hinted at supporting him – while Rousseff would succeed with only half of that. It is clear that Dilma and the PT will double down on their negative advertisements, now aiming at Aécio rather than Marina. The PT’s barrage over the airwaves will highlight the risks of abandoning the course set out by Lula and followed by Rousseff. Voters will be told that the opposition may underfund cash transfers, privatize the state oil company Petrobrás or treat it as a profit-making enterprise rather than as a development bank, thus increasing unemployment as occurred during the Cardoso years. And the PT will no doubt remind voters of its consistent efforts to boost minimum wages and chip away at the vast inequalities that had long characterized Brazil. Surely they will portray Neves as an elitist out of touch with the majority that has benefited from the PT’s redistributionist agenda. Aécio and the PSDB, by contrast, will highlight the worrisome slowdown in growth under Rousseff, the failure to significantly improve public services – it was frustration over health, education and, particularly, urban transportation that drove the social protests that began in mid-2013 – and the over-regulated and over-taxed economy. Most of all, Neves’ campaign will harp on the persistent scandals that have bedeviled the PT over the past decade and that have helped to fuel popular disdain for politicians. The election results in Brazil are likely to become increasingly polarized in terms of class. Dilma appears poised to prevail in the poorest states of North and Northeast, where Bolsa Familia and other cash transfer programs, subsidies, wage increases and Lula’s image are compelling. In turn, Aécio should come out ahead in the richer states such as São Paulo, which offer the largest pool of voters and where highly educated and middle- and upper-income Brazilians are concentrated. We make divergent predictions: Hershberg anticipates a PT victory, since for all the speculation about the travails of the Latin American left, it has built very substantial foundations of support in societies that credit the left with finally making some advances to tackle Latin America’s yawning inequalities. Warnings that Aécio represents a return to elite rule will resonate among the PT’s electoral base, and the PT’s success will be nourished by its powerful organizational capabilities. Melo, by contrast, anticipates a PSDB triumph. In this scenario, the corruption, disappointing growth rates over the past two years as the commodity boom has slowed, and widespread frustration about the quality of public services will generate an anti-incumbent dynamic that will bring to an end a dozen years of PT rule. 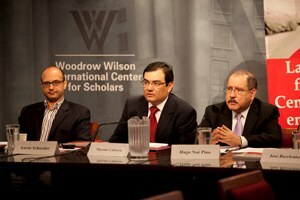 From left to right: Aaron Schneider, Maynor Cabrera and Hugo Noe Pino at the June 5 event on Central American fiscal policy. Economists are warning that Central America – unlike some South American countries and Mexico – has still not rebounded from the 2007 global economic crisis, and that current fiscal policies dim prospects for improvement. After making progress reducing poverty prior to 2007, the subregion has been stymied by static tax policies, insufficient investment in physical infrastructure, corruption, and natural disasters induced by climate change. This is the assessment of Hugo Noe Pino, Ricardo Barrientos and Maynor Cabrera, economists from the Central American Institute on Fiscal Studies (ICEFI), and Aaron Schneider, Professor of Tulane University, who presented their work at a CLALS-sponsored seminar at the Woodrow Wilson Center on June 5. The specialists’ research indicated that political resistance to fiscal reform is strong and comes from both new and traditional political and economic interests. Elites have not found common ground with the middle and lower class in most of Central America – a key element of Costa Rica’s success prior to the financial crisis. Absent an enduring fiscal pact, countries in the region are likely to remain plagued by persistently slow growth and unusually skewed income distribution. Violence and security dominate Washington’s agenda on Central America, but this focus largely misses the underlying dynamic between economic decline and crime throughout the subregion. Elites favor policies that discourage effective state‑building – including investment in security forces paid well enough that they are less vulnerable to corruption – and that exacerbate social inequalities. Political fragmentation and low citizen confidence in government institutions have dire consequences for national security, and countries get caught in the Catch‑22 of being unable to attract investment from abroad and encourage development from within as long as fiscal policies fail to promote an educated, healthy and skilled workforce. CLALS currently has a program investigating how traditional, renewed and emerging elites shape the political and economic landscape of Central America. For more information click here. And click here for a video of the ICEFI presentation and discussion at the Woodrow Wilson Center.